Country roads feel like home, for that is where the journeys take place. Journeys down sandy byways, through pines and marsh grass, to tea-colored rivers and salty bay beaches. Journeys down arrow-straight red dirt tracks, past wooden barns and fertile fields, to high dunes along crystalline lakes. Journeys down twisty two-lane roads, around hilly curves, to cliffs, meadows and waterfalls. 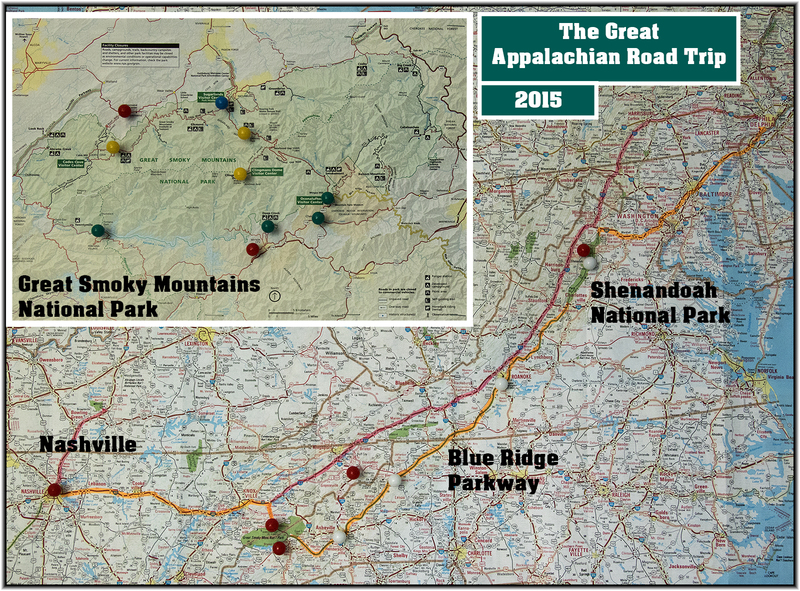 This Independence Day, those country roads took us home to the Appalachian Mountains. Home to a luxurious (and affordable!) cabin in Blackwater Falls State Park in West Virginia. 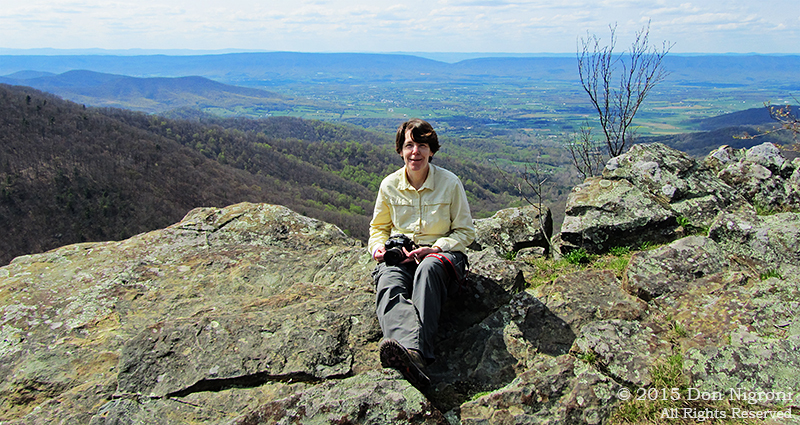 By day, Robb, Don and I explored the Potomac Highlands region, a land of steeply folded mountain ridges, deep gorges and broad valleys. 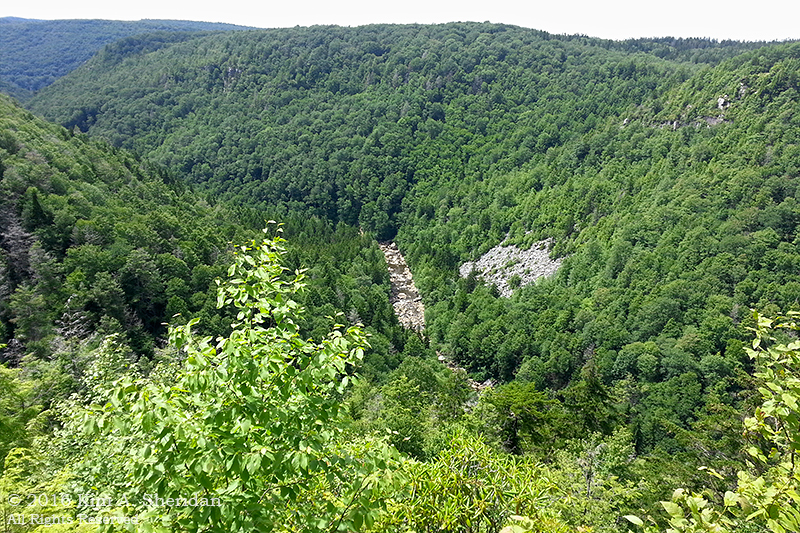 After checking into our cushy cabin, acquiring some vittles, and enjoying a yummy buffet at Blackwater Falls Lodge, we took our first look at Blackwater Canyon, 500 feet below. From on high, the Blackwater River is a pale ribbon woven through an undulating blanket of green. Up close, the forest resolves to trees of Eastern hemlock and red spruce, American beech and striped maple. Bracken ferns carpet the forest floor, alongside dense thickets of rhododendrons. Conservation Piece: We saw lush stands of Eastern Hemlock all over the higher elevations of the Potomac Highlands, which top out over 4,000’. It’s hard to imagine the mountains without this beautiful tree. 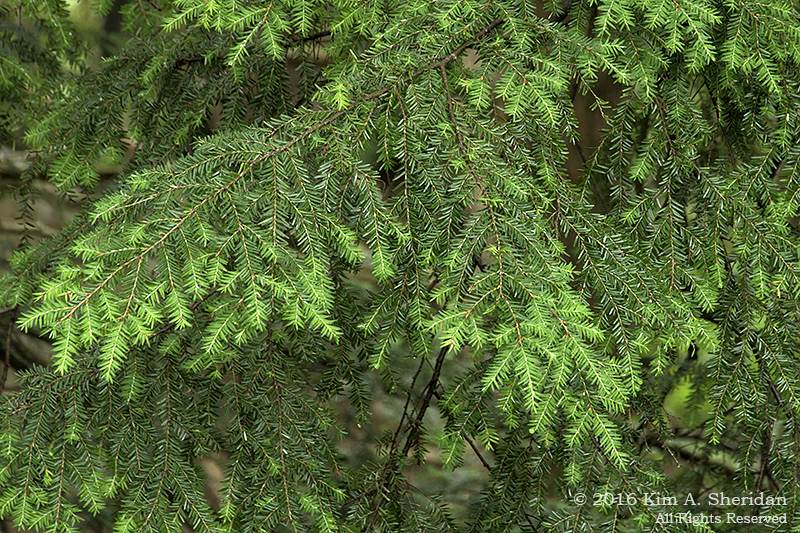 Yet the hemlocks are besieged by an invader from Asia, the hemlock woolly adelgid (ah-DEL-jid.) These sap-sucking insects appear as small white clumps on the twigs and needles and pose a serious threat to Eastern hemlocks throughout the Appalachians. 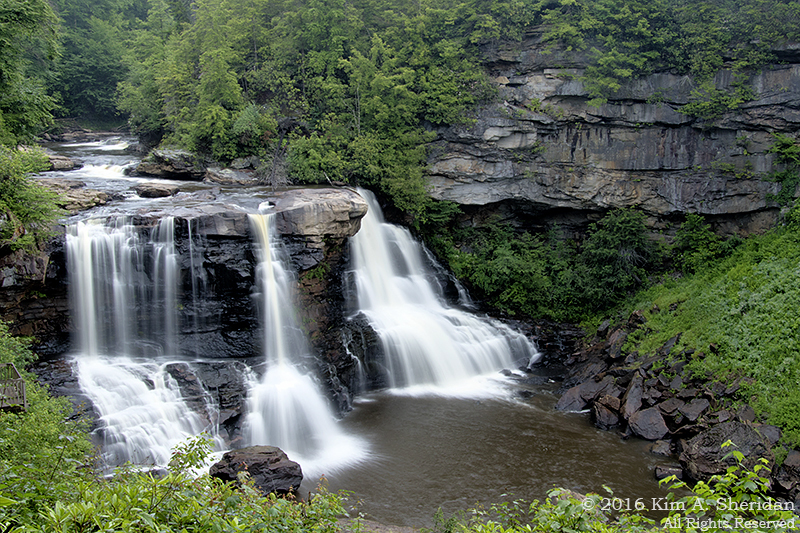 Not one day in the park could pass without a visit to Blackwater Falls. The trail is a wooden walkway interspersed with strategically placed landings amid more than 200 steps. 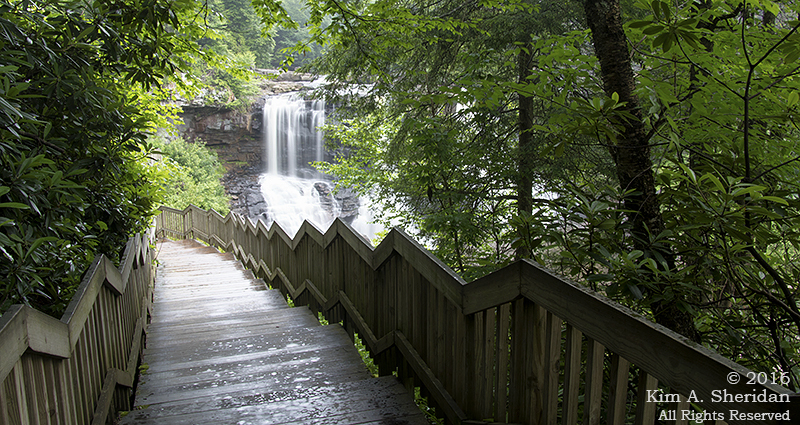 At the bottom is a long boardwalk with an overlook near the base of the falls. We could see glimpses of the falls through the trees as we descended. We could hear the falls even before we got to the trail. 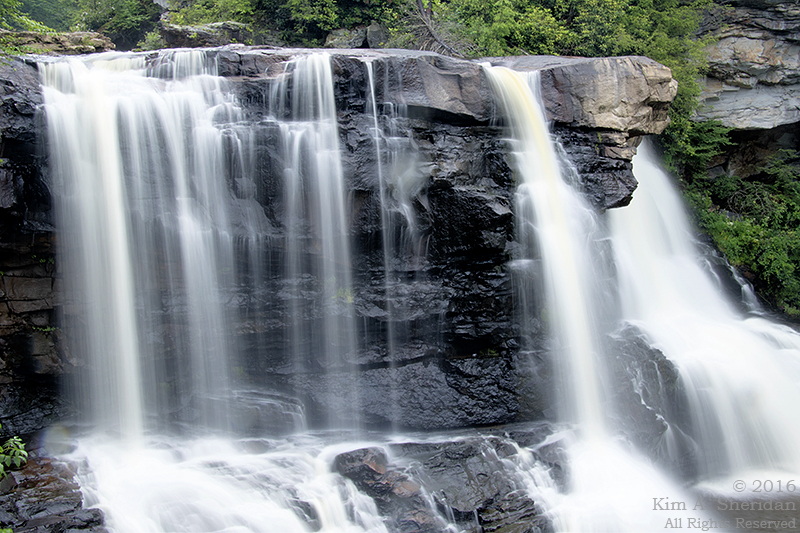 The classic tableau of Blackwater Falls. Looking at the Falls in this orientation begins to give an idea of their size. The main drop is 57 feet. 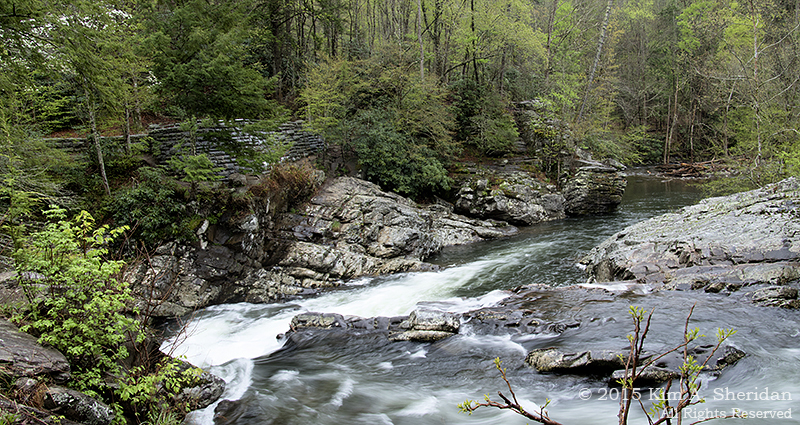 What isn’t conveyed is a feel for the depth of the gorge through which the Blackwater River runs. Or the force of the water. 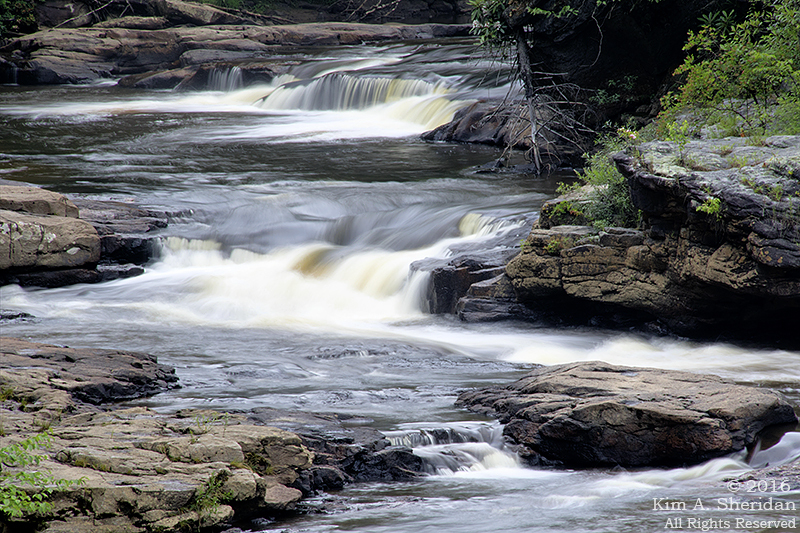 I asked Don, who’s been to Blackwater Falls a few times, how this stacked up in terms of relative water flow. 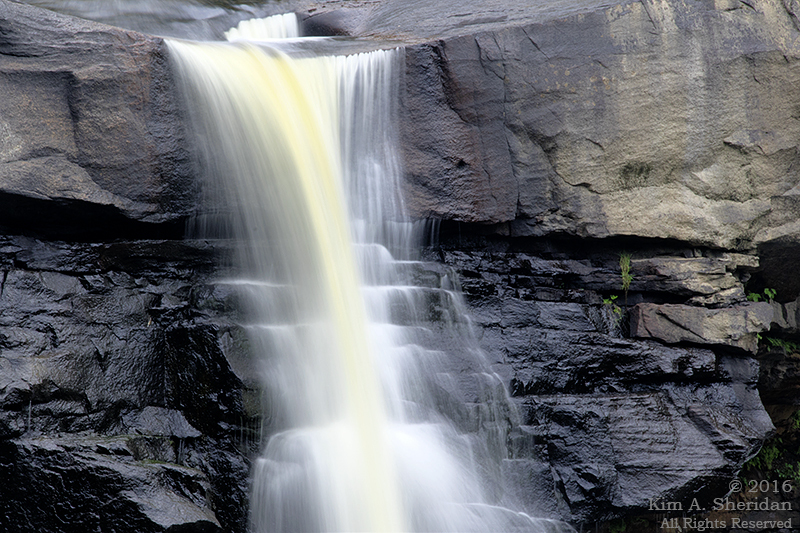 He said that this was one of the highest flows he’s witnessed at the falls, though he’d seen it higher. 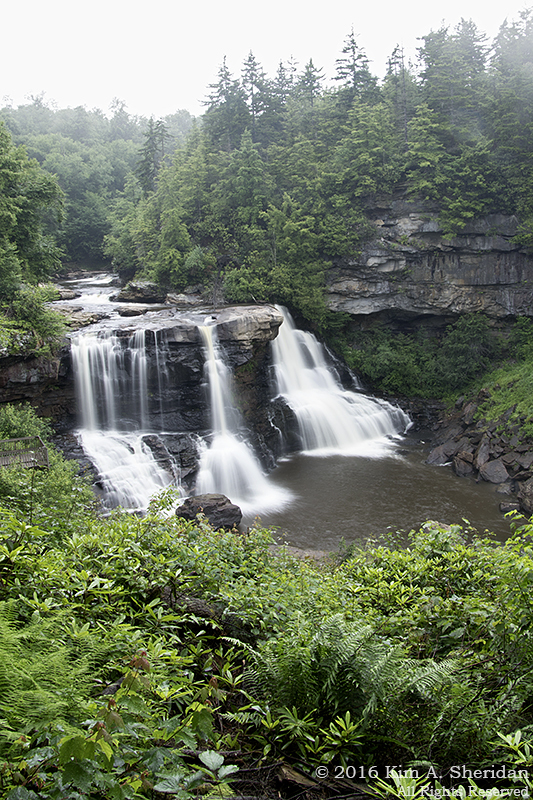 A photograph can’t convey the other sensory delights of Blackwater Falls: the scent of hemlock, spruce and rich wet earth; the feel of mist blowing back from the falls; the roar of water plunging over the ledges. Except…my camera takes videos. I rarely remember this feature, but I did this time. 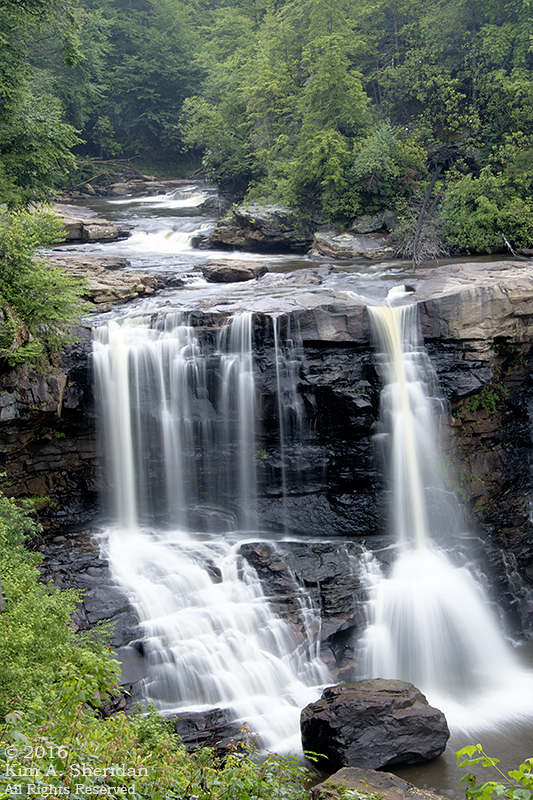 Click here for a 20-second video of Blackwater Falls and be sure the audio is turned up! By the way, all of these photos were taken, not on our first night in the park, but the morning of July Fourth, two days later, while my traveling companions were still in dreamland. 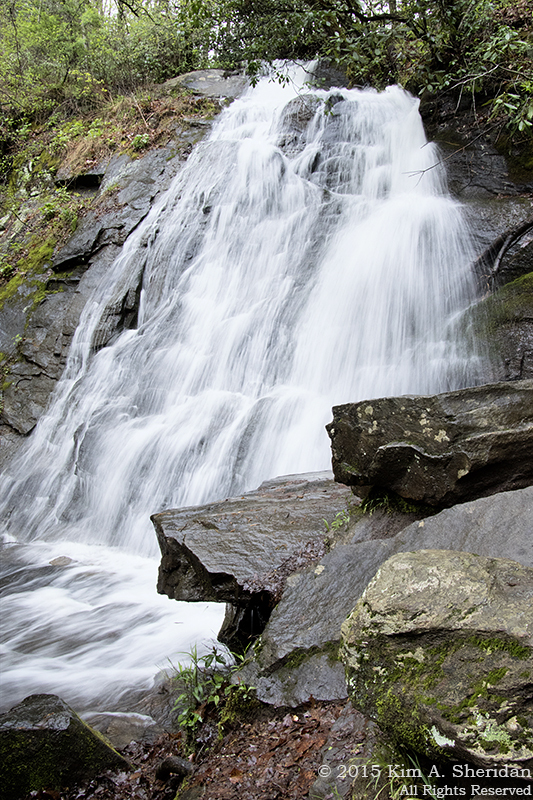 Tee-hee – I had the falls to myself. Heaven! 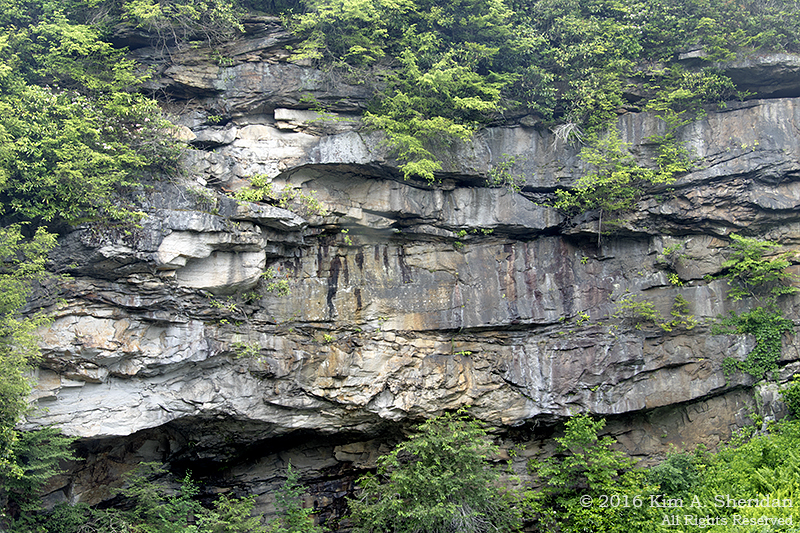 Above the Falls is a 40-foot cliff of sandstone, a sedimentary rock composed of quartz and sand. We saw a lot of sandstone in the gorge and throughout the Highlands. 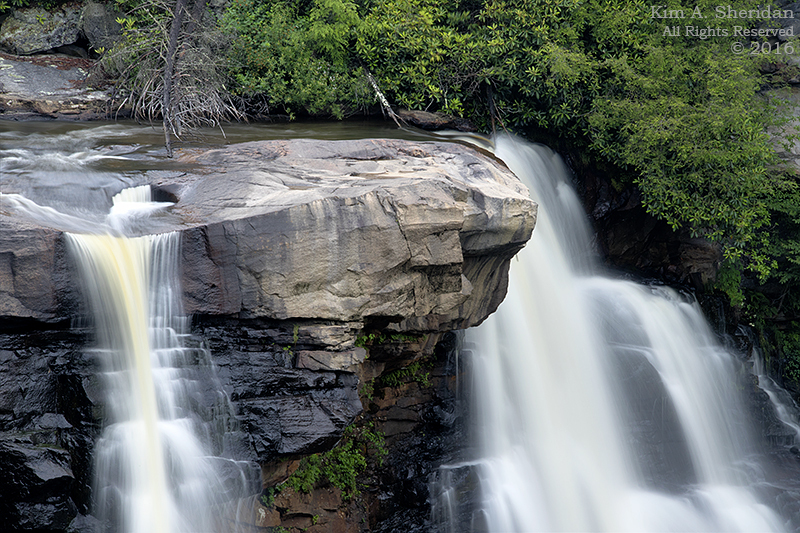 The most prominent ledge of the Falls. A lofty pulpit draped with satin vestments and backed by a rhododendron choir. Say “Hallelujah!” and pay attention to the preacher – there will be a quiz later. The baptismal font runneth over. The Blackwater River gets its dark tea-color – and its name – from tannins in the soil of the hemlock and spruce woods and marshes through which it passes. Much like the rivers of the Pine Barrens are tea-colored from pine tannins. The similarities between the Pinelands and upper elevation habitats in Appalachia never ceases to amaze me. Above the falls, water cascades down a cockeyed staircase. 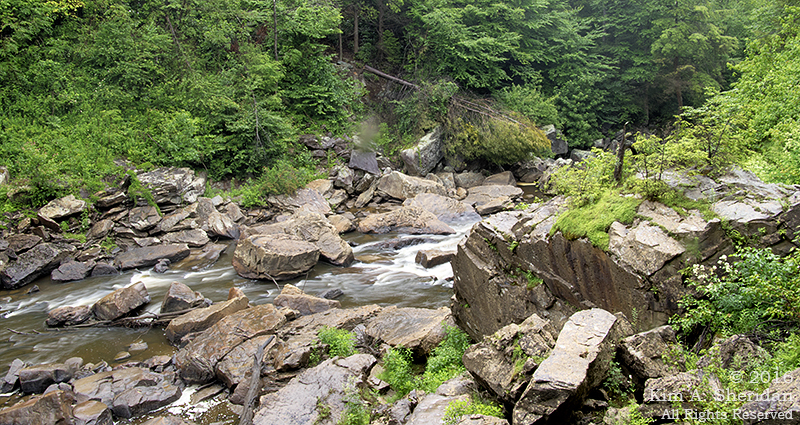 The river below the Falls threads through a jumble of sharp sandstone boulders under verdant tree boughs. yielding but ever so slowly to dark water’s caress beneath the bridges of time. Lyrics to “Country Roads” by John Denver, et al. The music begins, oh so softly. An ethereal voice wafts in on the wisps of mist swaddling the mountains. Then another voice enters, and another. Plink, plink, plinkety-PLINK. Little by little a staccato of raindrops pitter-patters on the leaves, drips onto the ferns and mosses below, and trickles into the loam, only to emerge again downhill. Soon the water droplets have blended their voices in a myriad of small seeps and runs. They babble their way down the mountainside in tiny rivulets, joining in an ever growing ensemble. 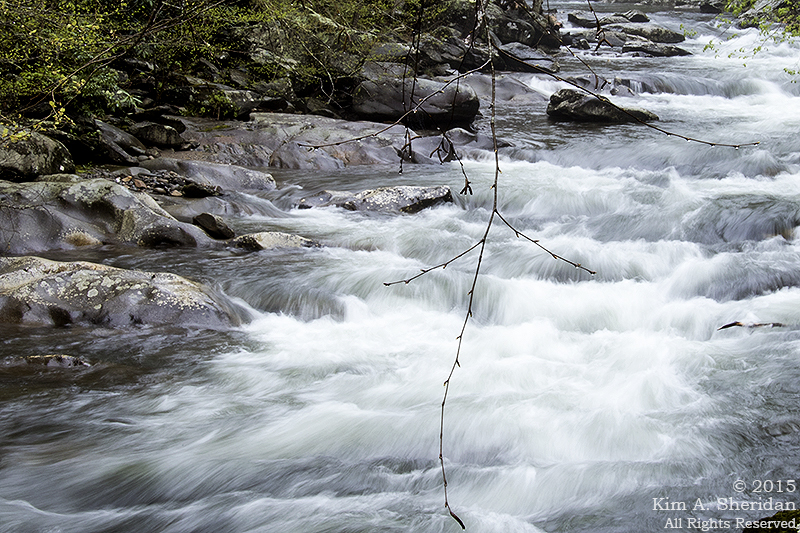 Rivulets become runs, runs become creeks, creeks become rivers. 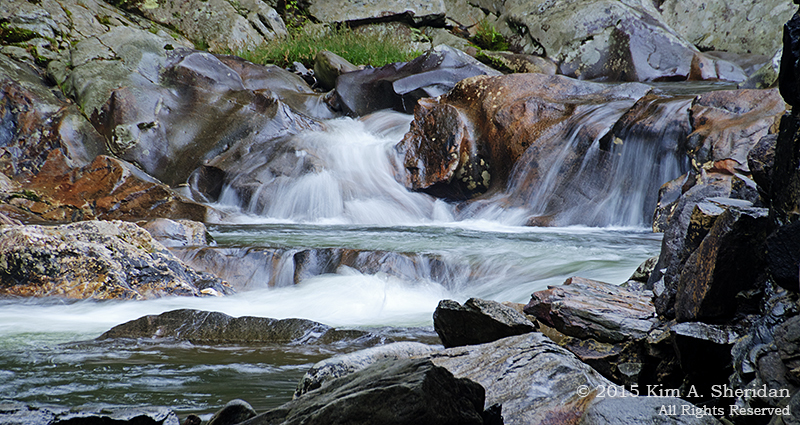 Each fresh stream that joins the current brings strength and resonance to the chorus. 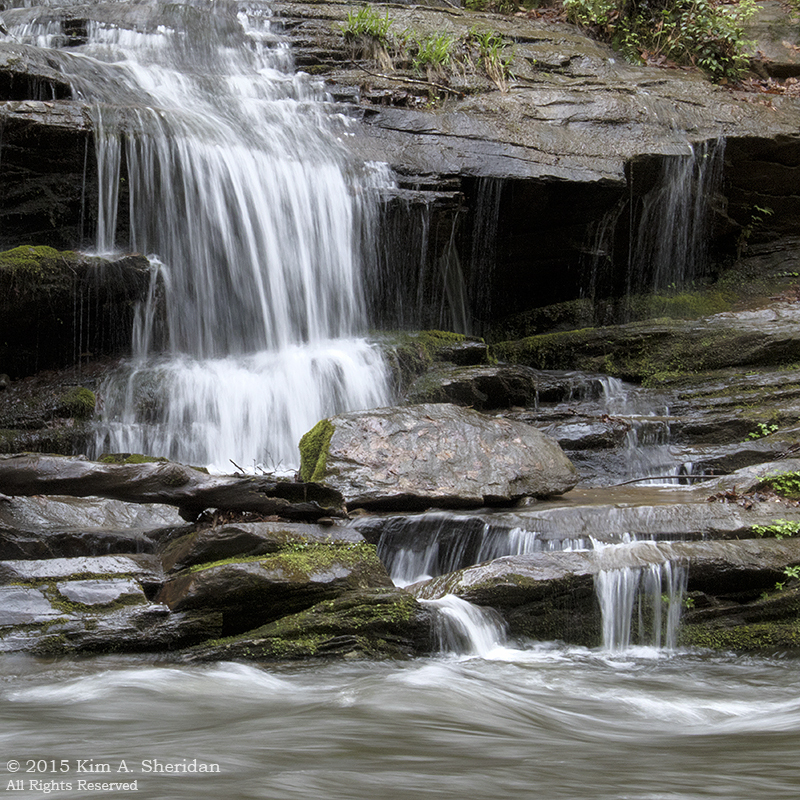 Soprano voices skim atop the rocks, while baritone and bass thrum deeply below the surface. The liquid choir skillfully interweaves melodies and harmonies, with the trill of birds a enchanting counterpoint. The watery tempo ebbs and flows. A quick allegro where the creek rushes through rocky channels and shallows, over stones of slate gray and russet. A stately largo as it reaches the quiet passages and shady deep pools. 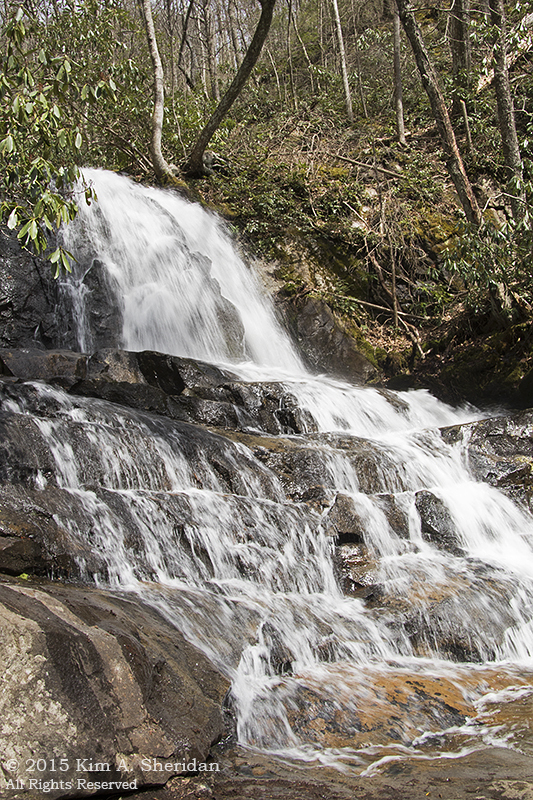 Juney Whank Falls, Deep Creek. The river builds with a crescendo. Reaching the brink, the water plunges in unison over a dramatic ledge. 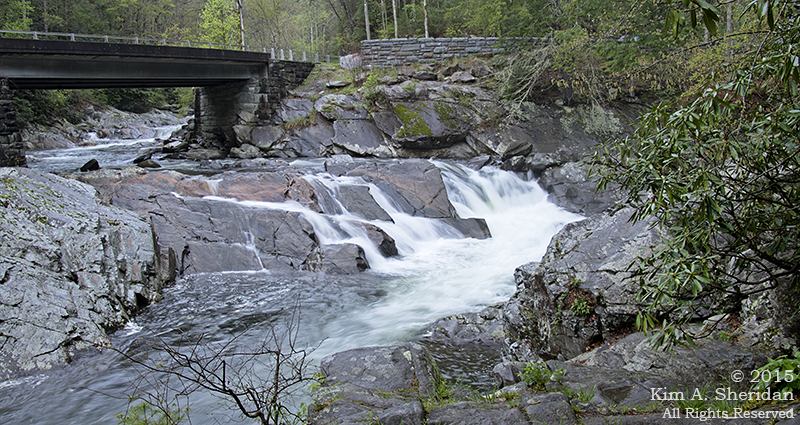 Tom Branch Falls, Deep Creek. 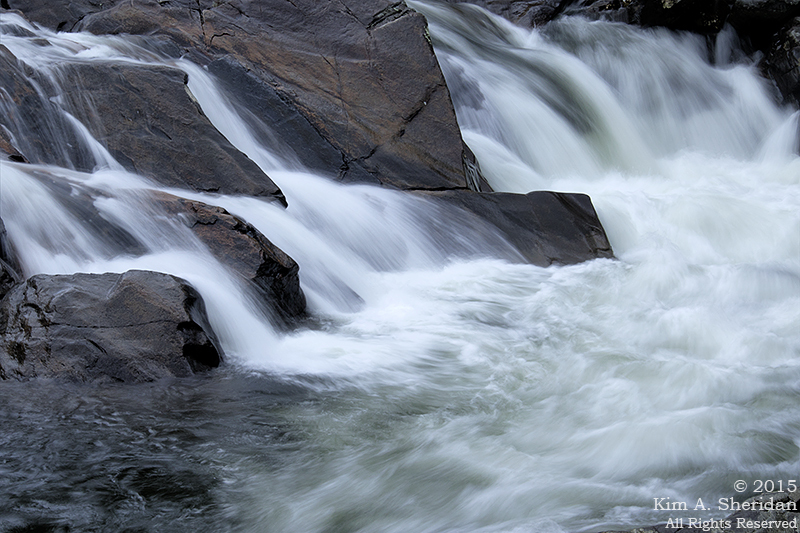 Only to break again into many voices, lacing increasingly intricate harmonies into the braided flow of the waterfall. The symphony knows neither coda nor encore, only an endless surge to the sea. 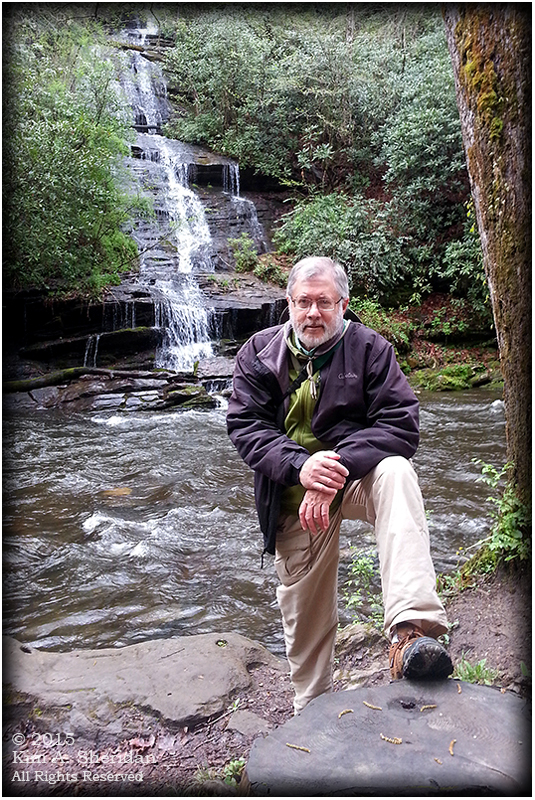 Don looking the part of the dapper woodsman at Tom Branch Falls, Deep Creek. 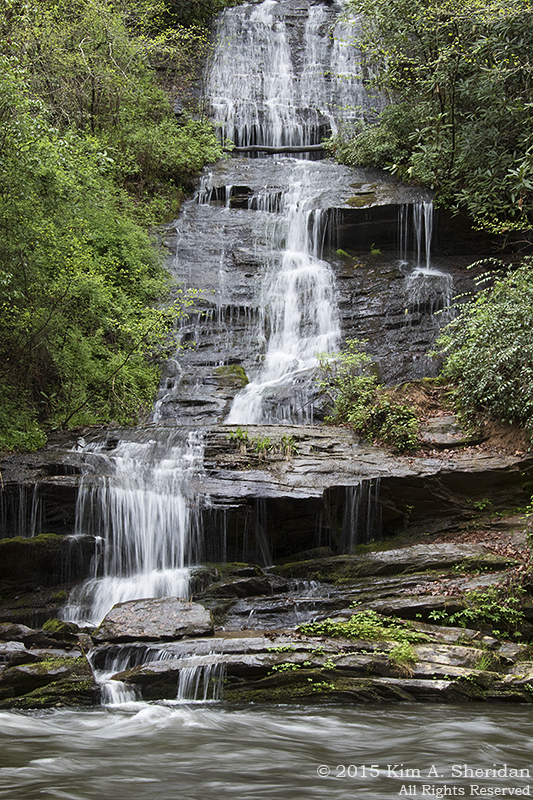 The melodious soundtrack of the cascades and waterfalls accompanies the beautiful display that delights the eye of the beholder. Indian Creek Falls, Indian Creek above Deep Creek. 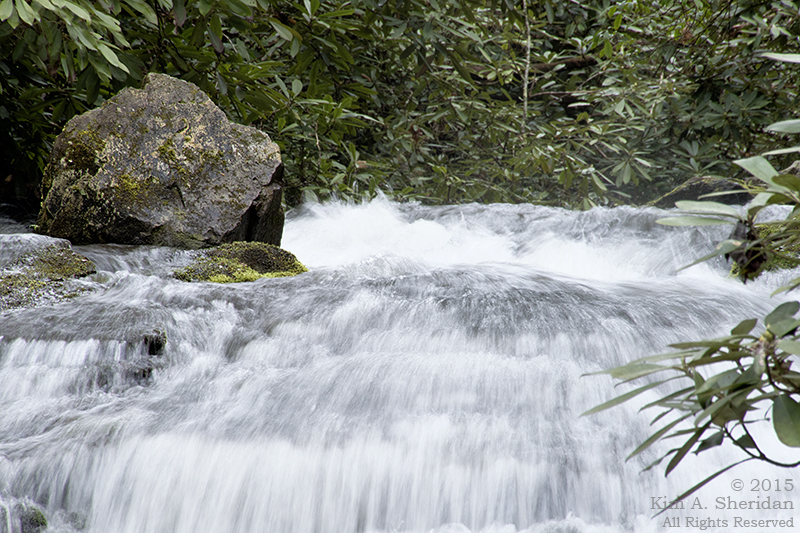 Water is the lifeblood of the Smoky Mountains. 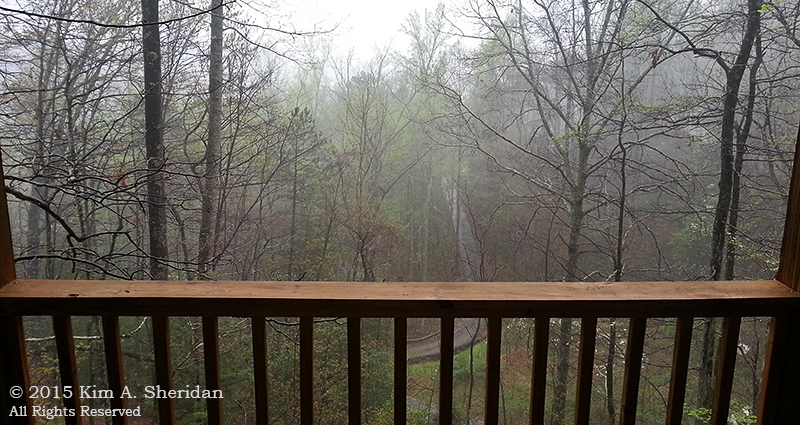 Frequent rain and ever-present mists feed both the lush forest and the creeks and rivers. 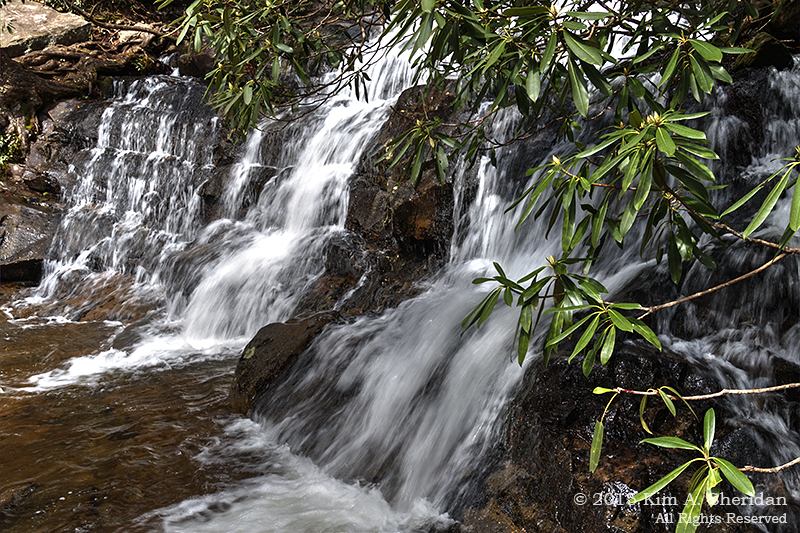 Still water, rushing water, falling water – this is the music of the mountains. Over the next few months, a short weekend trip to Nashville mutated into a two week odyssey through the southern Appalachian Mountains. 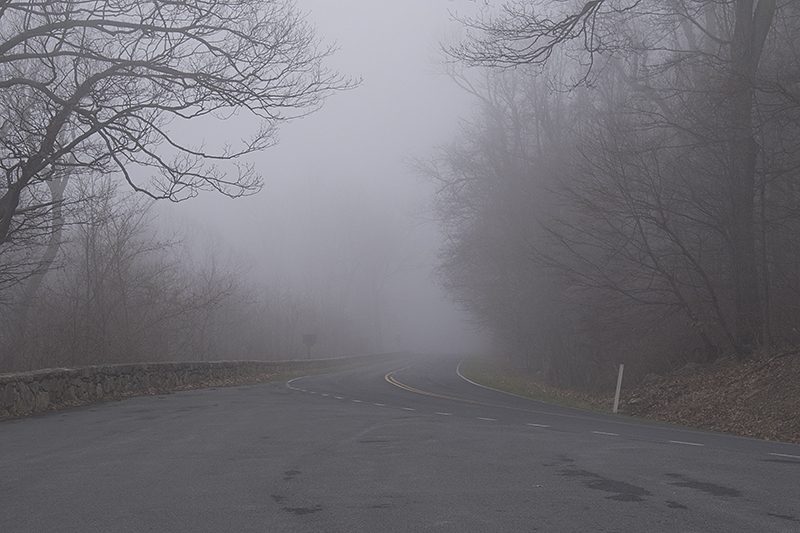 Day 1: Our first view of the journey, fog in Shenandoah National Park. Famous last words from a road-trip neophyte. Not knowing any better, I hatched a plan that Don charitably termed “ambitious.” He threw caution to the wind, however, and joined me on the road. Luckily for me, he single-handedly rescued the trip from the brink of disaster. The expedition turned out to be challenging and rewarding, full to the brim of new vistas and new adventures. Day 2: On top of the world, young and naive. Shenandoah National Park. Don and I drove 2,396.9 miles through five states in 15 days. Day 4: Nashville, TN. 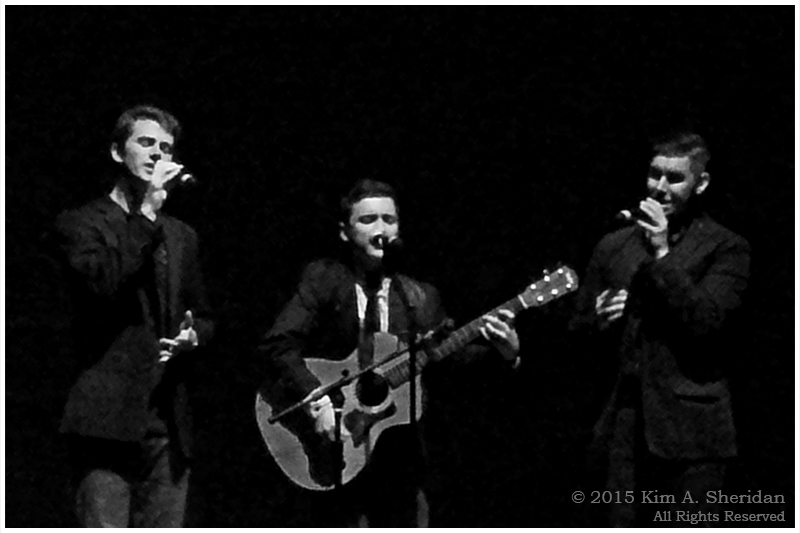 The three graduating seniors of the Vanderbilt Melodores perform. My cousin Ted, Dan and Augie. I visited with 10 relatives, and finally saw my cousin Ted perform. 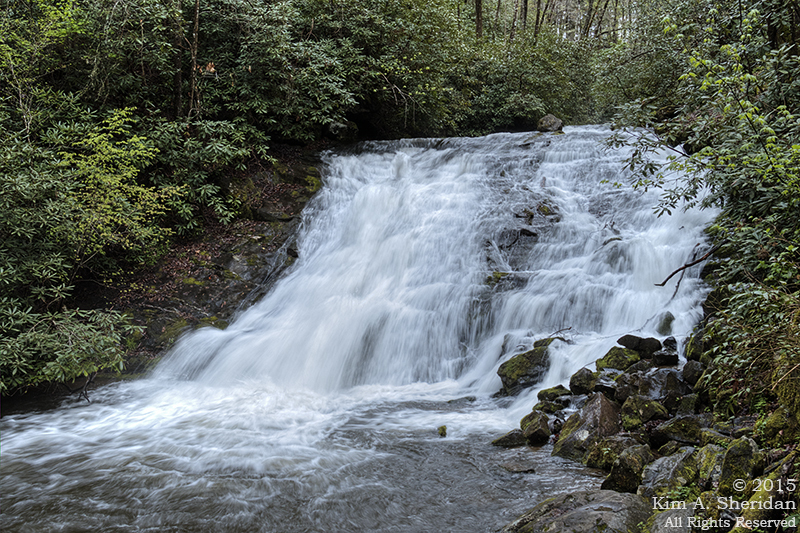 Day 5: Laurel Falls, Great Smoky Mountains National Park. Don proudly ushered me through the ancient Greek Parthenon – in Nashville. 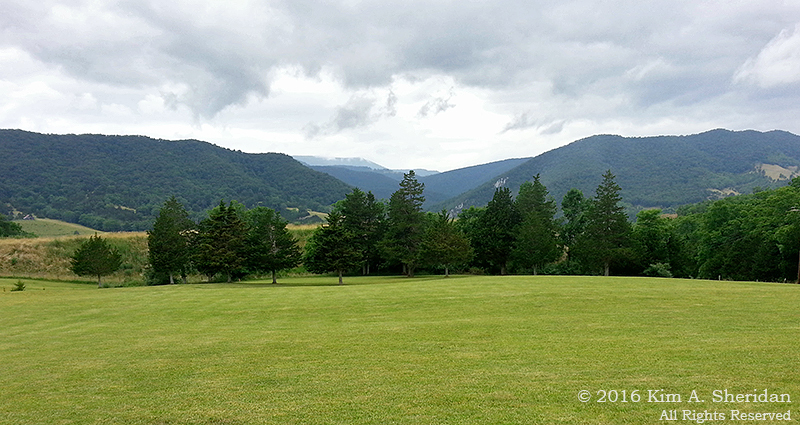 Day 6: Overlooking Cades Cove, Great Smoky Mountains National Park. We visited three National Parks in as many states. 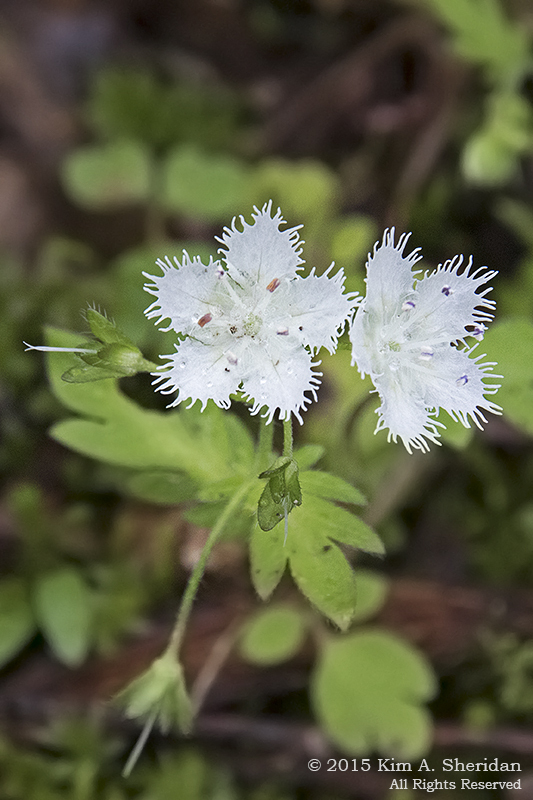 Day 7: Wildflowers along Newfound Gap Road, Great Smoky Mountains National Park. We saw six waterfalls and countless wildflowers. Day 8: Bryson City, NC. 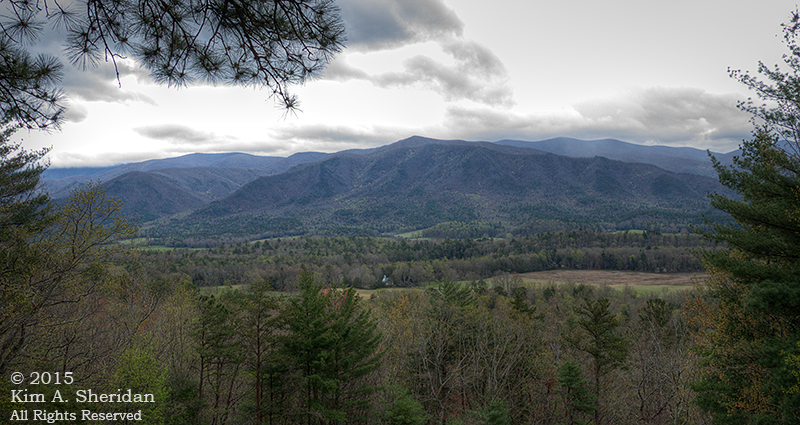 The view from our cabin on the edge of Great Smoky Mountains National Park. We toured a Cherokee museum and a casino, and walked across a dam. 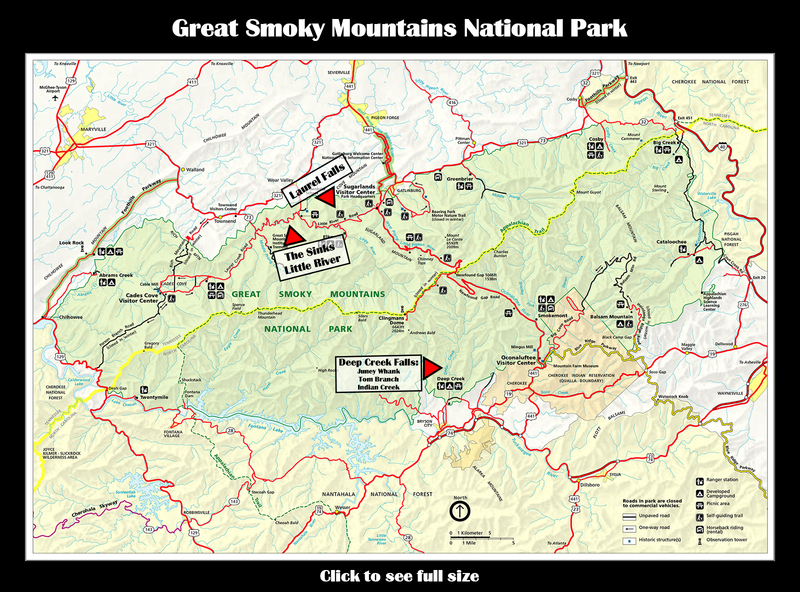 Day 9: Juney Whank Falls, Great Smoky Mountains National Park. We hiked through old growth forests, grassy balds and boreal forests. 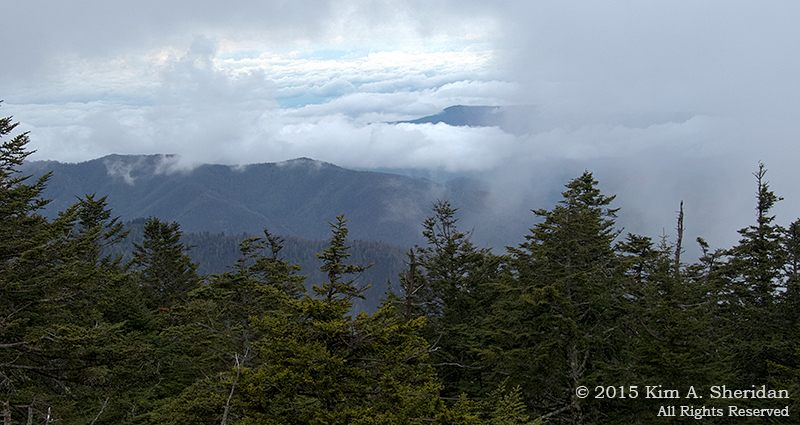 Day 10: Atop Clingman’s Dome, Great Smoky Mountains National Park. 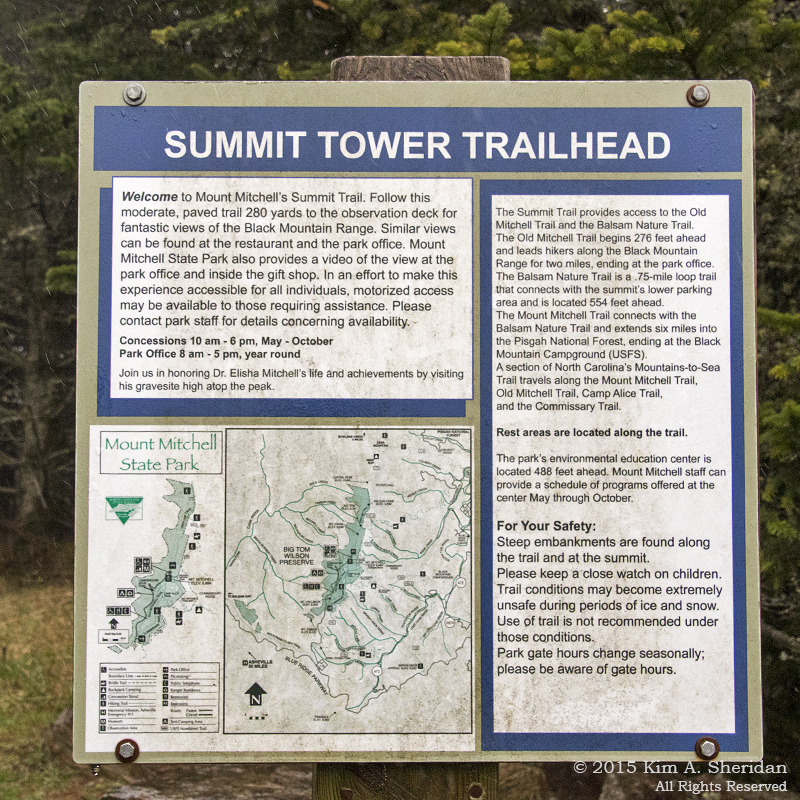 We walked to the summits of the two highest peaks east of the Mississippi. 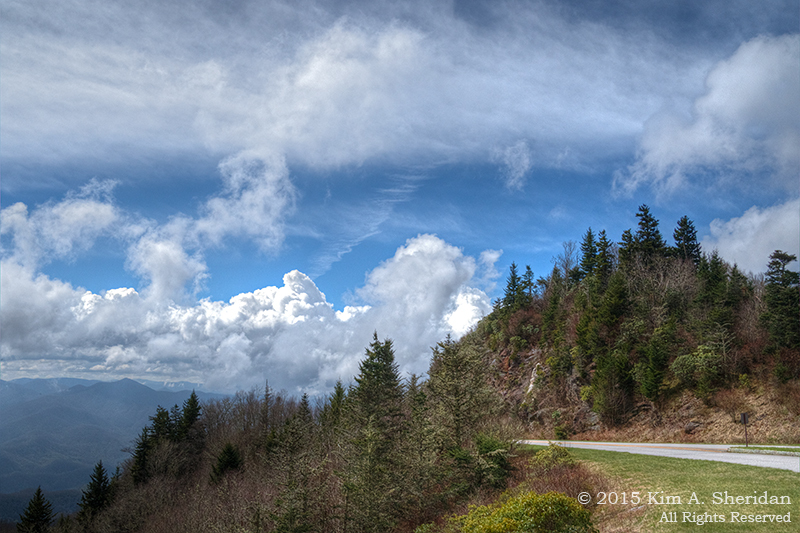 Day 11: On the Blue Ridge Parkway. We observed 3 salamanders, 11 elk and (Yes! FINALLY!) 5 black bears. Day 12: En route to Mt. Mitchell, at the edge of the Blue Ridge Parkway. We got rained on for nine of the fifteen days. And don’t even get me started about the fog. 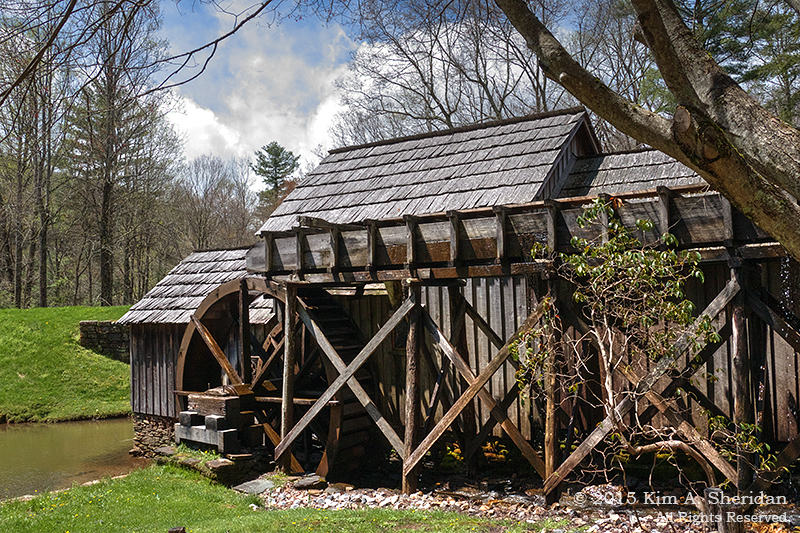 Day 13: Mabry Mill, along the Blue Ridge Parkway. We came home tired of cars, tired of fast food, tired of hotels, and just plain tired. The weather was a disappointment, the trees weren’t green yet, and the bears weren’t close enough. I’d set my expectations way too high, and things didn’t always go according to plan. 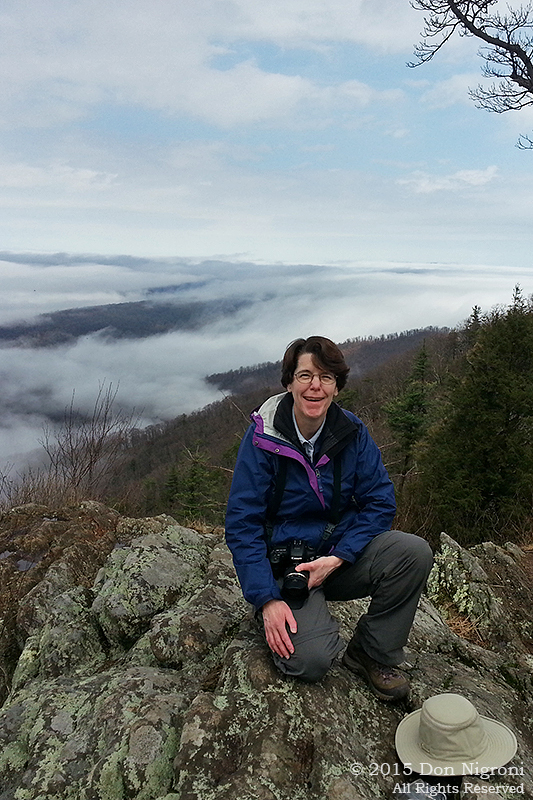 Day 14: Back in Shenandoah National Park, older and wiser. Still on top of the world. But in the process, Don and I learned a lot about the Appalachian Mountains, I learned a lot about myself, and we came home with lots of good memories. And you can’t ask for anything more than that. Day 15: Last vista of the trip. 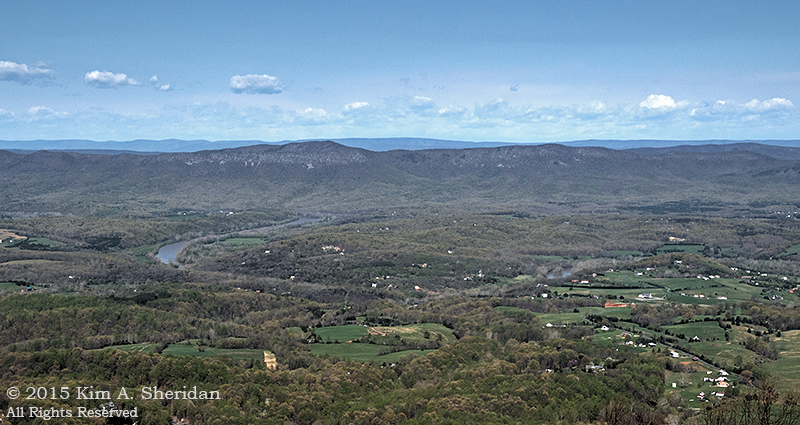 The Shenandoah River, from Shenandoah National Park.